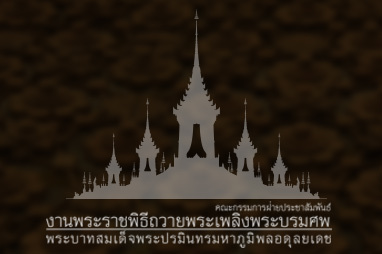 The Small Royal Palanquin with Four Poles, or Rajendrayan Noi, is a new palanquin specifically built to carry the Royal Ashes of His Majesty King Bhumibol Adulyadej from the Royal Crematorium at Sanam Luang to be enshrined at two temples, namely Wat Rajabopidh and Wat Bovoranives, after the Royal Cremation Ceremony. Both Rajendrayan and Rajendrayan Noi are similar in style, differing primarily in size. Rajendrayan Noi is made of golden teak, with a square-shaped busabok, measuring 4.14 meters in height and one meter in width and 5.48 meters long. It is also decorated with a figure representing Thep Phanom, a celestial being with hands pressed together in prayer. This Royal Palanquin needs 56 people to carry it.